Why can I look at her attempts and see only beauty, but when I go through the same process each morning and look in the mirror I only see the shortcomings. The misplaced hair or eyeliner that doesn’t look like a Pinterest photo. The nail polish that chips and the lips that are too small, even when I try to put on lipstick. Why do I accept her finished product as beautiful and mine as messed-up, even when they’re on the same person: me. We have such grace and mercy for those around us, don’t we? Especially our children. We see the intent behind what they do, how hard they try, and the pureness with which they do so, and it’s those qualities we value. It’s those qualities we cherish. It’s the lens through which we see the end product, and it makes it incomparably beautiful in our sight. Yet we cannot seem to apply the same lens to ourselves. But we are God’s children, and he looks at us just like we look at our own. Every attempt of pure heart made in him. Every ounce of love we pour out. Every stumble. Every wild hair. He sees it all and to him we are all-together beautiful. He sees no flaws because we are his children. We are covered in his sacrifice and loved beyond all measure. That is the reflection he sees. And that is the reflection we need to look for. Lord, we pray that you would take those things we’ve held as truths in our lives in regards to our beauty, and replace them with your own Truth. Begin to reshape our hearts and minds to see the reflection you see of us. 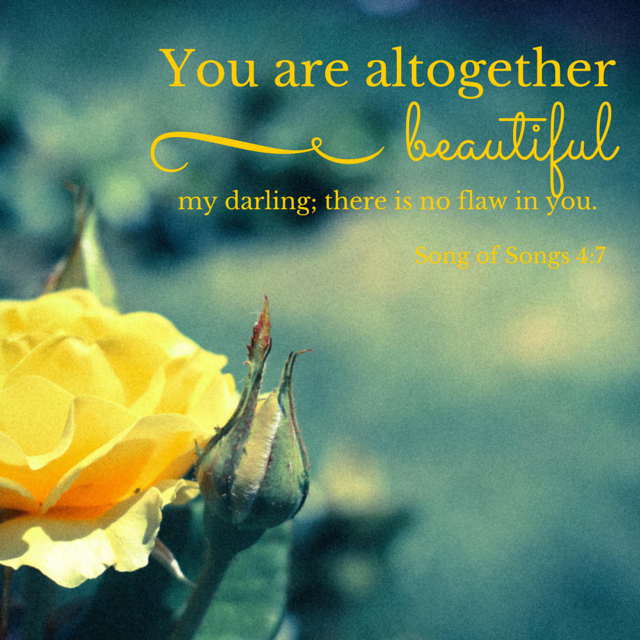 Help us to see even our short comings as beautiful in you. May our likeness be wrapped in you and you alone. Amen. Today stop and look at yourself in the mirror. Pay special attention to those things you normally call out as your flaws, then speak back today’s verse. Remember, in Christ there is no flaw in you. I challenge you to start believing that today.